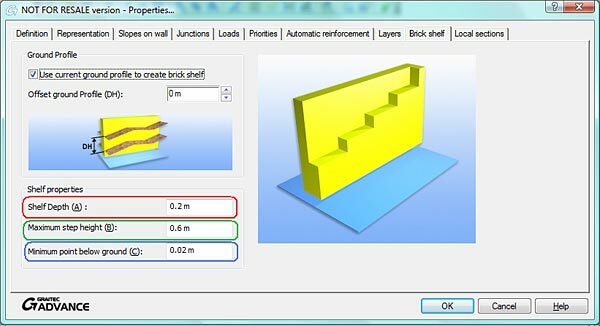 To design a wall with a brick shelf use the "Edit the wall brick shelf" command on the Advance Model toolbar. Draw the slope profile using a polyline and specify the shelf dimensions. Draw a wall with the same length as the slope profile (for example, 5 m = 5 x 1 m). Copy the slope profile above the wall. Launch the "Edit the wall brick shelf" command, select the wall and press < Enter >. The program will ask for the selection of a polyline that defines the slope profile. Select the polyline. - Minimum point below ground: represents the wall height part that is below the ground C = 0.02 m.
- Offset ground profile: (DH) = 50 cm in this case. Create an elevation of the wall to see the new profile. Launch the "Edit the wall brick shelf" command. Select the wall, press < Enter > and select the profile created with a polyline. Modify the shelf depth (A) in the properties dialog box, and also the offset ground profile "dh" which is 50 cm in this case. The step height is already set by the profile. 1. The brick shelf properties dialog box can also be accessed from the general properties of the wall. 2. 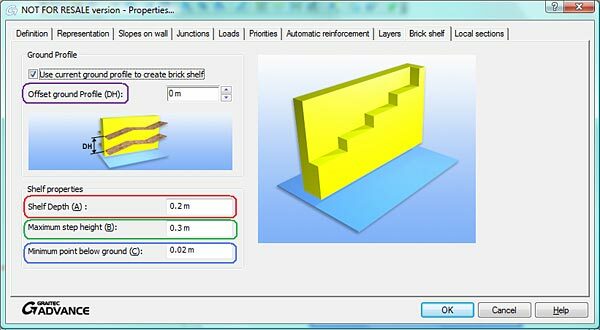 The offset ground profile value will reset each time you open the brick shelf properties dialog box.